Zonneweelde finden Sie in, in Seiner Art, das schönste Wiesentmoorfeld Noord-Hollands, sehr nah an dem IJsselmeer. Oosthuizen befindet sich im Mitte des Gebietes Edam/Volendam, Purmerend und Hoorn. Sehr Empfehlenswürdige platze, alle mit einem sehr hohen kulturhistorischen Hintergrund. Diesen Historische Hintergrund können Sie selber anschauen in die historische Bauwerken und Museen. Alle Informationen sind bereits in einer Mappe gesammelt und stehen zur ihre Verfügung. In our beautiful polder, with his canals and ditches, we give you the possibility to make a boattrip. This way you can experience the waterways of Noord-Holland, by which you get a different view on the surroundings. 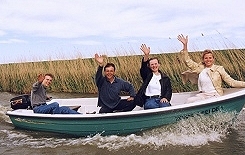 With a boat you can get to villages and areas which are difficult to reach by car or bicycle. In the nature of Noord-Holland you will come across various species of birds and other animals that live in the polder. Zonneweelde is an excellent point to start a bicycletrip. Different species of birds will greet you with their singing. When you reserve at Zonneweelde, you can rent a bicycle for a whole day. Information about the beautiful bicycletrips is available at the boarding-house. Bright lights, big city? Amsterdam! A small capital with a big history. It�s one of the most beautiful historical cities, with a huge number of museums, restaurants, shops and, of course, canals. When it�s happening, it�s here. When it�s a little strange, it�s here. Amsterdam is less than a 20 minute drive from Zonneweelde. Alkmaar is called the `cheesecity' or the city of cheese. It dates from the middle ages and has got over 400 monuments. The surroundings of Alkmaar offers plenty of variety, relaxation and pleasure, and is excellent for a daytrip. 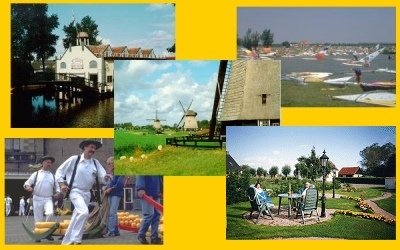 The typical Dutch landscape shows you polders with farmhouses, (wind)mills, water-courses, bulbfields and villages such as De Rijp and Stompetoren, which are really worth a visit.